I haven't done a 'Collection' post in a while, so I thought I'd show you all my Lip Crayons collection! My collection has grown significantly over the last few months, and it's all drugstore so you can get 3+ of these for 1 high end one! There are 4 varieties that I have so I'll group together the colours in the same line to prevent this being a ridiculously long post! Revlon Just Bitten Kissable Balm Stain - I have 'Crush' and 'Honey' from this collection (the first two swatches from the left). 'Crush' was the first lip product I used that really got me into darker berry lip colours. I love this one for winter time, whilst 'Honey' is a natural everyday shade, that I have even got my mum into wearing. 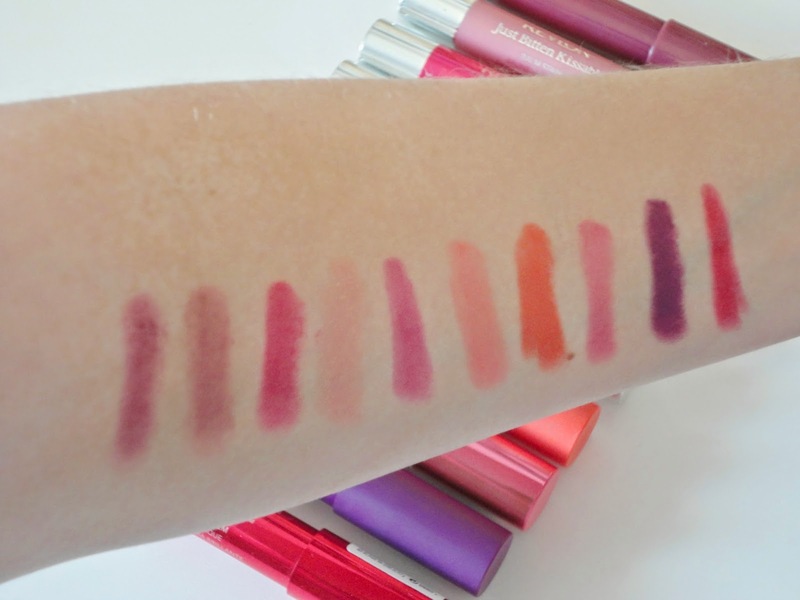 Revlon Lacquer Balms - I have 'Vivacious', 'Demure', 'Coquette' and 'Provocateur' from this collection, and as you can probably tell from my collection, these are my favourite line of lip crayons. They glide on really nicely, add a nice sheen to the lips, whilst still packing a punch in the pigmentation department. My favourite of the four would be 'Vivacious' - which you can see in a Makeup of the Day post here, but you can see my full review and pictures of me wearing 'Provocateur' here and here. Revlon Matte Balms - I have 'Audacious' and 'Shameless' from this collection. These are such an innovative product as they are completely matte, but don't leave your lips looking dry or dehydrated as they still have the balm aspect to them. 'Shameless' is one of my absolute favourite winter lip products, and I wore it so much during last winter. 'Audacious' on the other hand is a gorgeous summer lip colour - an orangey, coral that I have also been on my lips a lot this summer. Bourjois Color Boost - I have 'Fushcia Libre' and 'Peach on the Beach' from this collection, and you can see me wearing 'Peach on the Beach' here and here. Although these are lovely lip crayons, they aren't as pigmented as the Revlon ones, and that makes me reach for the Revlon ones over these. I have used 'Peach on the Beach' a fair bit as it's a lovely summer colour, but I have to say that 'Fuschia Libre' has been neglected. 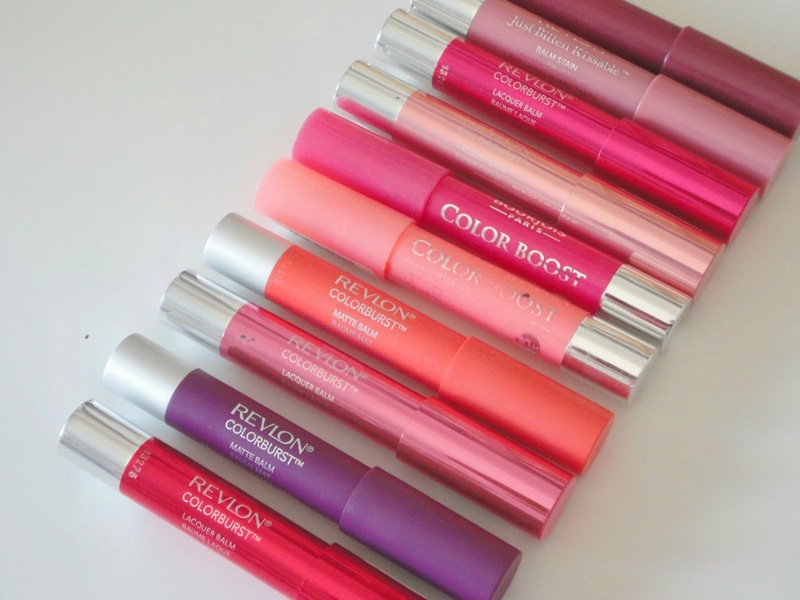 If you're in the market for lip crayons, I'd go for the Revlon ones unless you want a sheerer colour.